If you’re unsatisfied with the world as it is, you may feel tempted to enhance it. To make it more beautiful. And, in 2018, Google and their ARCore Android can help you achieve that. ARCore is a development platform for building augmented reality apps. In this article, I’ll walk you through its functionalities and how the technology itself can enrich your everyday life. I’ll also show you, step by step, how to make your own ARCore app. You could say that augmented reality allows you to create your own world using your mobile phone. In technical terms, AR makes it possible to enhance your real-world environment with computer-generated 3D models, images and videos. When you look at something through your phone’s camera, you see/hear all the virtual additions as a part of the environment. Provided, of course, that you install a required AR app. Why is AR one of the most popular technologies of 2018? It’s probably because there are so many ways you can use it – the only limit is your imagination. Augmented reality has the potential to impact and enrich all aspects of our lives. Read on to find out how. Since my article focuses on ARCore, let’s begin with a short trip into the past. 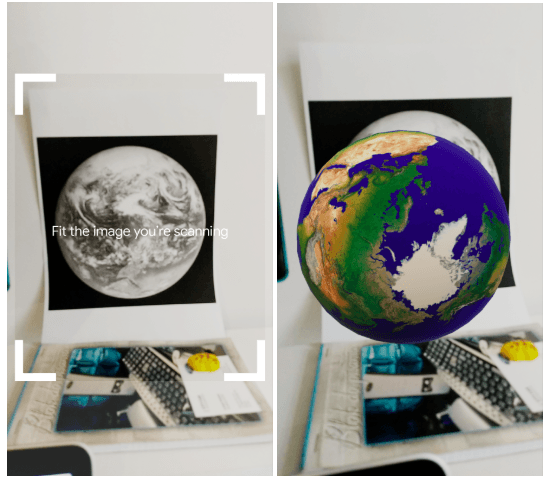 On February 23, 2018, Google released ARCore ver. 1.0.0. Since then, Android has been supporting augmented reality. In the first version, Google implemented basic functionalities, like: tracking a phone’s position in the real world, detecting the size and location of environmental planes, as well as understanding the environment’s current lighting conditions. In addition to these features, ARCore 1.0 introduced oriented points which allow you to place virtual objects on non-horizontal or non-planar textured surfaces. API for getting colour correction information for the images captured by the camera. vertical plane detection, which means that ARCore started detecting both horizontal and vertical planes. getAndroidSensorPose() returns the world-space pose of the Android sensor frame. getTextureIntrinsics() returns the camera texture’s camera intrinsics. New class CameraIntrinsics that provides the unrotated physical characteristics for a camera, which consists of its focal length, pricinpal point, and image dimensions. getConfig() returns the config set by Session.configure(). In the previous section, I wrote about the functionalities of Google ARCore. Now, let’s leave the technical details behind for a while and appreciate just how visually impressive augmented reality is. Are you ready to see how you can incorporate it into your life? Imagine it’s beautiful outside and you’re going on a bike trip to a brand new place. You’ve never been there before, so, of course, you’ll need a guide. With augmented reality, your phone can serve as an excellent guide, showing you where to go based on your location. Here’s one example. Or let’s say you’ve just moved to a big city, but you don’t have any friends there yet, so you don’t know how to get to all the interesting places. If you have an ARCore compatible device, it’ll locate all the points of interest nearby and show them to you real-time. All you need to do is point your phone at the street. ARCore Android can also assist you when you want to decorate your new place or buy a new piece of furniture that doesn’t clash with the rest. Just point your phone where you want to place the new stuff. In the remaining part of this article, I’ll teach you how to create a simple ARCore app with markers and videos. In ARCore, markers are 2D images in the user’s environment, such as posters or product packaging. In your app, you will use markers to show a 3D model of the Earth and a short video played after the user clicks on the model. This will be the first step to creating something bigger later on, e.g. your own guide for a museum. Let’s get to work! use ARFragment – you don’t need to write code to check if ARCore Android is installed on your device; ARFragment will do it for you! Okay, now that your environment is up and running, you can start building the app. As I mentioned before, it will show you a fraction of ARCore’s power. Now you have everything to start importing 3D models into your project. Time to find some models! You may start with this website. Just remember that models should be OBJ, FBX, or glTF. For more information about importing 3D models into your ARCore app, check out this site. Great! You’ve imported models into our app. Now, let’s have some fun! Create an assets folder inside your project, in your app package. You’ll be saving images for markers and videos there. Remember to use only .jpg and .png image files. This method should be invoked in onResume() method. That’s it! Try scanning the image and you should see a 3D model of the Earth on your screen (or whatever image you chose). Your ARCore app now allows you to import images and 3D models, add them to the database and show a 3D model after scan marker. But one thing is still missing – showing and playing videos. ARCore doesn’t support playing videos in a straightforward way. To implement it, you need to use OpenGL. I used the code from here. That’s it! You can find the full code for MainActivity here. As you can see, creating a more beautiful world with augmented reality is very simple. Google ARCore gives you the freedom to make almost anything you want. Why almost? The technology is still very young – with amazing potential, but without many features we need. Google developers are gradually adding new features and fixing bugs, but there’s a lot to be done. Still, despite all the bugs and missing features, ARCore Android is worth getting familiar with. At least, that’s what I think. In my project, I’ve used the info from an article titled: Playing video in ARCore using OpenGL. I’ve also used some code from Google ARCore samples. You can find all the code for this project here. 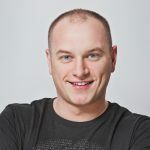 Despite his nickname – which is “iPhone” – Łukasz is an Android Developer. A great enthusiast of technologies and poker, he also loves to ride his motorbike in the free time.